We are seeing a growing number of reviews of our book (which you can buy here) including the following. "Businesses and executives are ... vulnerable on a number of levels. They would do well to reflect on the serious messages contained in this well-argued book." "This book manages to balance highly credible business advice with just enough science to give their findings depth and substance. It should become essential reading for everyone sitting on a board"
The topical nature of the subject matter and the quality of the examples and references combine to make this a challenging and valuable addition to a director’s reading list. The “Questions to Mull” section at the end of each chapter will help managers to apply the lessons of the book to their own experience. Masters’ business students will also find it relevant and interesting." Rating: 5 star, a must read." "The authors have produced a crisply written tome which is easy and engaging to read. Its format of insights, followed by case studies and then solutions works well. This should be no surprise. The authors Anthony Fitzsimmons and Derek Atkins are well versed in this area - their previous publication Roads to Ruin on behalf of Cass Business School for the insurance and risk industry is rightly highly regarded. They bring their experience to bear in this book." 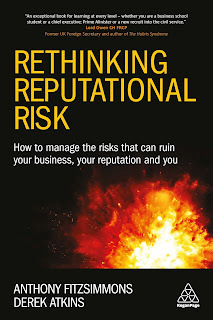 "The idea that people are key to mitigating and combatting risk will come as little surprise but, in Rethinking Reputational Risk, the authors take us beyond vague notions of culture and compliance to examine the biases, fallibilities and skewed priorities that led to disasters as varied as MidStaffs and Deepwater Horizon as well as how to genuinely avoid them in the future." "Their attribution of [reputational] vulnerability to unrecognised, often systemic causes, is what makes the book worth reading"
"After walking the reader through the risks that can lead to failure, the authors offer a series of insightful case studies. There is a wealth of information here, especially in the take-home points they offer at the end of each chapter. [T]he book ... uses reputation to explore how and why people fail and why systems, such as the three lines of defence for example, are flawed." 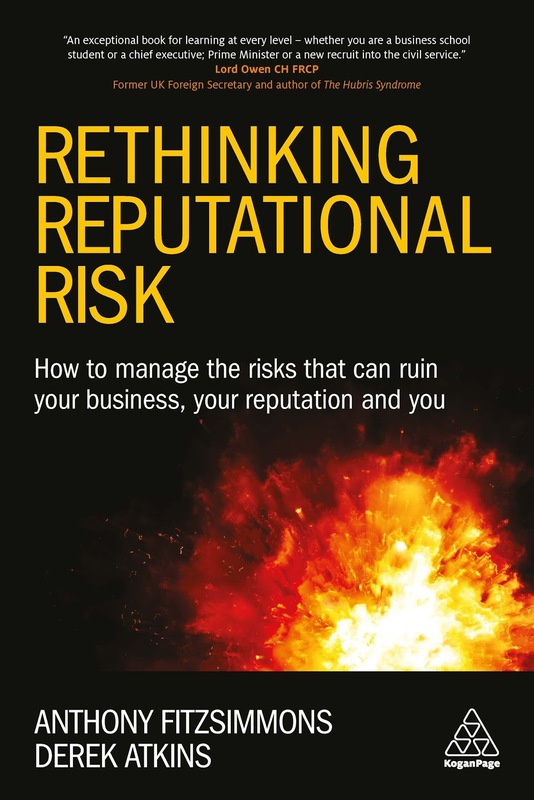 "This insightful guide could help you answer some of the hard questions relating to one of today’s most critical aspects of risk management." "It’s ... [hard] for an organisation to ask itself what it is about its own culture that might lead to reputational damage. But as hard a question as this is, it’s the most important one. And though it might make us uncomfortable, unlike some external risk factors it has the benefit of being something that it is relatively straightforward to do something about." 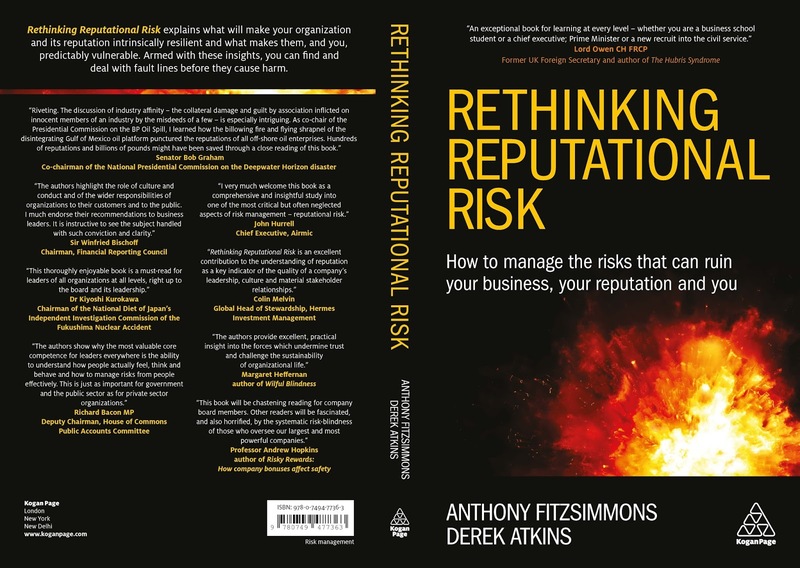 "Rethinking Reputational Risk ... focuses on re-evaluating much of what businesses thought they were supposed to be doing. Many business owners, blinded by overconfidence, believe their business can weather a crisis without serious damage to their reputation. This book disagrees and explains why." Anthony Fitzsimmons is Chairman of Reputability LLP. You can find his blog, on matters concerning behavioural, organisational and reputationalrisk, at www.reputabilityblog.com.